Remake of the street hero shot for Martin St, Brighton residences. We love this shot, especially modeling the beautiful old London Plane tree. Completed last year, we also produced a VR tour of the new luxury development, at Sebastopol Residences, Caulfield. The Virtual Tour can also be viewed in full screen by clicking on the small white square (bottom left hand side) once loaded. The Tour can also be viewed in a VR headset (such as Samsung Gear VR, Occulus, Google cardboard) when accessed via a VR compatible mobile handset. Just launched: render set produced for Glen Huntly Rd Apartments, working with architects Clarke Hopkins Clarke. 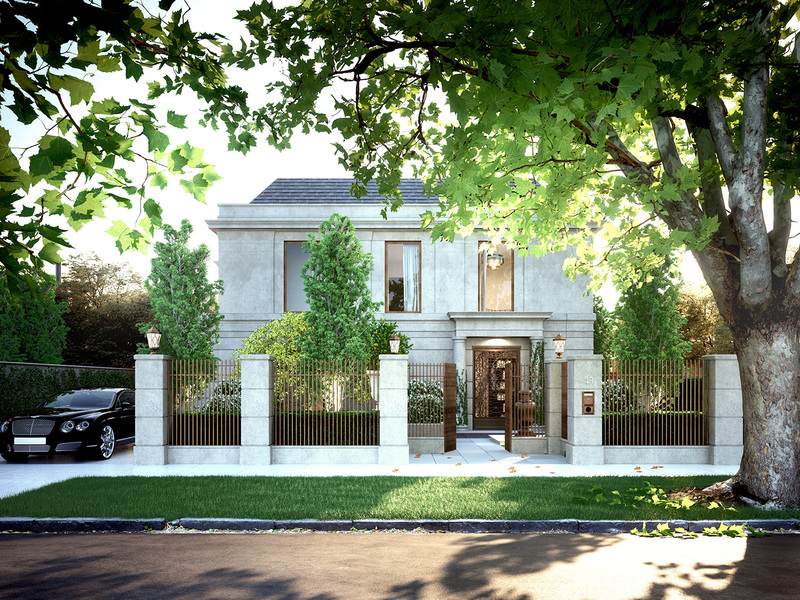 Works in Progress, boutique townhouses on Malvern Rd, Glen Iris. Upcoming project in Hampton (bayside Melbourne) for some high-end residences, with renders aimed at the top of the market to suit. A beautiful new project, working with the talented Martino Leah architects for the first time. Was an absolute pleasure with consummate professionals, and we love the end result! We’ve been so busy, we forgot to add one of our favourite projects – The Hutton Thornbury, with Zunica Design, for Adio Properties. Loved working with this team, and we love the result. Following on from the previous post showing the model set-up and construction of the town planning / VCAT views, here are the developed photo-montages rendered and worked up for Butler St, Camberwell. The images show texture and material development to accurately represent DP Toscano’s architectural intentions for the building, from the locations as selected by council. The images also show the approved neighbouring development as a white overlay, so as to demonstrate the massing of the future development. From a workflow point of view, these images show the difference between an image produced for council / VCAT which intends to be more informative – illustrating planning and height considerations, as opposed to marketing images which are designed to show a more “glossy” representation of the building. VCAT proposal for a small site in Bridge Rd, Richmond. Images included all peripheral VCAT reports / documentation validating accuracy of images.